We live in a two story house, that used to be my Grandparents. It wasn't a two story when I bought it, but that's another story. There is a huge pine tree on the northwest corner, by our bedroom window, that we could almost touch if we reached out the window. We also have a particularly obnoxious red squirrel, not to mention the 1/2 a million grey squirrels that like to play in our yard, particularly in the trees. This obnoxious red squirrel likes to get up high in the pine tree (we can easily see him) and chatter until Annie comes out to play. He starts chattering early, before we're even out of bed, and Annie hears him. She runs over to the window and starts to whine and do her little twirly thing she does when she's excited. Well of course we let her out, it is morning and she has been holding it since before bed. Out the door she bolts, across the deck, down the steps, around the bushes and under the pine tree. She's whining and wiggling and the squirrel is chattering and clicking, and then she starts to bark. If you've ever heard a collie bark, you know this is NOT a pleasant sound. She sort of sounds like an adolescent boy with his cracking voice. Her bark is like that, high pitched and shrill mixed up with some normal tone barking. It's enough to drive you crazy. She plays with the grey squirrels like this too, but they don't make as much noise as the obnoxious little red squirrel. This squirrel will be our garage, on his way to hide in our wood pile, and when he sees our car pull in the driveway, he'll stop and cling to the post and stare at us, chattering away, like it's his home and we're trespassing. Yikes, he's icky! 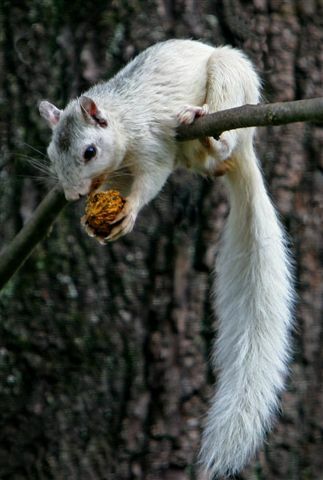 As you can see, this is a picture of a "White Squirrel", not our obnoxious red squirrel, but I don't have a picture of him and I do have a picture of this white one. You'll just have to use some imagination. Last evening I started a commissioned dog portrait, and because I need to have something to both watch and listen to while I draw, I was looking for something good, that I had already seen, because I won't be paying a lot of attention. It took me longer to decide on something to watch than it did to do everything I do when I start a portrait. What did I choose???? LOST! I thought I'd start at the very beginning, because it's a very good place to be, and knowing how it finally ends, I think it will be fun to try and catch all the hints that J.J. Abrams and Jeffrey Lieber give us. No matter how many times I watch this show, I do not get tired of it. I only wish they had those little cheater comments at the bottom of the screen so I could actually catch all the hints they throw at us. Oh yeah, the portrait is looking good too! After too many days being cooped up indoors because of high heat, humidity and rain, David and I went out to dinner. I suggested going out, because I had spent the better part of the day packing up more stuff to send off to Kira. I just didn't feel like cooking, although it's rare that I ever do feel like it. Cooking is NOT one of my talents. We decided to try Brooklyn Center's new restaurant Mango Tango that finally opened in the old Chi-Chi's building that has been vacant for several years. Every time I drive pass, the parking lot has quite a few cars and we had been talking about going, so we did. David had the Jambalaya that he seemed to like well enough to almost lick the bowl clean. I had the Mango Papaya Pork Loin over mashed potatoes and julienne veggies. Yum! I had to put half in a container to enjoy for lunch tomorrow, or I would have kept picking at it until my plate was clean. David would then have had to roll me out of the restaurant. I looked at the reviews it's had so far, and some are good and some are horrible. There are some people that can't say anything positive about anything though, so I tend Not to pay any attention to them and decide for myself instead. Anyway, I give it a thumbs up. I wish them well and I hope people give them a chance. Brooklyn Center has been getting a bad rap for awhile now, and it's slowly changing and pulling itself together. I would be extremely happy to finish the first six, then move on to the weeding, and I know I could finish it all, providing I don't even turn on my lovely computer, or iPod. Unfortunately I know myself only too well, and I can certainly put off until tomorrow what I should be doing today. Maybe I should start the day off with a Dunn Brother's Mocha IceCrema, or maybe I should just have one of my flavored coffees from Target on crushed ice. That would save me a bunch of calories. Yeah, the coffee along with my energy pills ought to do the trick! Better be off to bed then, if I want to get an early start on whittling down my list. This is the latest one for a sweet little baby girl with a mommy named Heidi. I've always loved a good storm. Watching the clouds roll in, building in types and colors. Rolling, puffy, low lying, white, blue grey, green. Storms are exciting and frightening, awesome and dangerous. I could feel the tension and excitement and anxiety build in me, as I watched the sky for changes. Heat lightening, that's what we used to call the lightening you can see far off, in and through the layers of dark clouds. I could watch it for such a long time. Huge bolts of lightening that cut through the sky and down to the earth. I know those bolts have got to hit somewhere. I would get the kids all excited too, and we would stand outside on the deck watching until it got too close and we would be forced indoors. But now I get a sick feeling in my stomach when a storm is approaching, all because of a crazy collie named Annie Belle. She's getting much better at predicting an approaching storm, although she controls herself pretty well, as soon as the first crack of thunder sounds, she is running in circles, panting and drooling. Right now as I'm typing this, I am kneeling on the floor and she is lying on my ankles. I suppose I could just get up, but what the heck, if it makes her feel better, I'll put up with a little discomfort for a while. We give her 'calm tabs', with valerian root, ginger, chamomile, but it only works so well. Needless to say, the thrill I once felt for a good storm has been replaced by dread. Ah well, it could be worse I suppose. While walking around the open pit mine, I heard a noise near my feet that I knew had to be a chipmunk. After wandering around the ‘Grand Canyon of the North’, we kept on driving north to Ely. Our destination..the International Wolf Center. They have ambassador gray wolves in their natural habitat on display to educate people about the world of wolves. One of the theaters has windows and a bench running the entire length for viewing. The wolves were raised by people and then introduced to the pack, so they are comfortable with people moving around behind the glass. People are not allowed to go out there, even the people working there don’t, because they can easily pick up nervousness, or illness, or even a pregnancy that was unknown at the time! They are fed once a week on Saturday evening after the center is closed for the day, but for an additional fee, you can stay and watch the wolf pack dynamics of a ‘kill’. They are fed ‘road kill’ that has been frozen to kill any parasites or bugs etc., then thawed, compliments of the people that live near Ely (they all know to call the Wolf Center when they come across ‘road kill’, and someone from the center will drive out and pick it up). Their two choices for dining enjoyment are deer or beaver. The wolves come from other Wolf Habitat centers and are not put back into the wild. The sole reason for this center is to teach people about wolves, how they interact with each other, what they eat, the importance of Alpha and Omega, and what that body language and howling means. They have over one and 1/2 acres of wooded land to hide in if they feel like being aloof, and a large pond with a bridge to play in if they want. I was closing the blinds in my bedroom this morning, (because my husband left them open) to keep out the light while the air conditioner was running. I saw something dark brown caught in between the screens on the north side bedroom window. It looked a little like a bunch of wet, decomposing leaves. I knew it wasn't that, because it's only August, and the leaves wouldn't look like that until next spring, after they've been closed up in garbage bags all winter. Upon closer inspection I discovered that it was a bat. Now there is hardly any room in between the screens on combination storm windows. Maybe 1/2 inch, but he squeezed himself in there. I took several pictures which look just like what I'm seeing, the problem is that it hardly looks like what you would think a bat looks like. If you can imagine it squished into a 1/2 wide space though, maybe you do have a picture in your mind. I'm hoping that he's smart enough to get himself out of there, because I have no intention of giving him a helping hand. We drove up to Hibbing Mn on Thursday evening, August 5, and stayed at the Hibbing Park Hotel (they had fresh cookies...yum. Friday we went to Hull Rust Mahoning Mine, the world's largest open pit iron ore mine. It covers 3,075 acres. The maximum length is 3.5 miles, east to west. The maximum width is 1.5 miles, north to south. At its deepest point, it is 535 feet deep. More than 1.4 billion tons of earth has been removed from the site, which is equivalent of digging a narrow tunnel from Minnesota, through the center of the Earth, and out the other side. More than 800 million tons of iron ore have been shipped from this site. At peak production in the 1940s, as much as one quarter of the ore mined in the U.s. came from the Hull Rust pit. The water in the pit is spring fed, and at its deepest point, it is more than 200 feet deep. Looking down from the observation area, these huge pit shovels and dump trucks look teeny, but up close, even the 'small' ones are enormous.